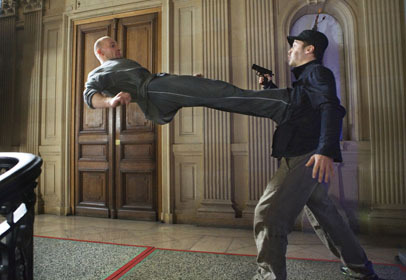 Luc Besson produced a hit with the original District B13, which gave perhaps the best showcase of parkour (free-running) in film to date. The film revolved around uptight cop Damien Tomaso (Raffaelli), who must get into a walled-off slum district in Paris to stop a local drug lord from selling a nuke, one that he received unbeknownst to him from members of the government themselves in an attempt to wipe out the population of District B13, the only way they believe they can eradicate the bad elements–by wiping everyone out. Damien succeeded, with the help of gang leader Leito (Belle), who was looking to save his sister from the drug lord. At the end the French government promised to take down the walls and rebuild the post office and schools. Damien promised he would make sure the government kept their word. This is a much bigger film in many respects from the original, and the story is tighter, but there were characters like K2 and Taha and Lola from the first film that I really missed in this one, and the void they leave isn’t really filled. Not that there would be much time for that as Patrick Alessandrin keeps things moving at a brisk pace, moving even faster than the first film, hitting many of the story beats of the original, perhaps too much. The opening fight between Rafaelli and the club thugs over a painting is fun but not as humorous as the opening of District B13 in the illegal casino hall. The same goes for David Belle’s first run, where the police chase him, isn’t the jaw-dropper that the run in the first film was, but they make up for it later with an extended chase across rooftops that surely caused many of the stuntmen to pay their chiropractor or massage therapist extra, and Cyril has a great fight versus the police in the scene where he tries to escape the police station. Bigger is the word here, and the finale, where you see dozens of parkour practitioners scaling the walls of the capital building is a site to see. Rafaelli and Belle inhabit the skins of their characters again with ease, and MC Jean Gab’1 is a lot of fun as well, but Elodie Yung almost steals the film away as Tao. She’s a tattooed deadly beauty, with long ponytailed hair that have blades attached to the ends, which she uses rope-dart style to fight her opponents. Tao would’ve made an awesome evil Bond girl! The fights, once again choreographed by Cyril, very much have a late 80’s, early 90’s Jackie Chan style about them. It’s both playful and painful to watch, as stuntmen bounce off of a bunch of things, and sometimes a few things in the same fall. The fight versus the police officers is the best yet, and Cyril keeps showing everyone that he needs to have more films of his own! David Belle’s parkour suffers a bit, as some of the stunts are camera trickery and special effects, but enough of it is real so it didn’t bother me much. It just didn’t seem necessary as David Belle’s running is enough of a special effect. As an aside, I don’t care what the story calls for, in no way does Cyril Rafaelli look that female from behind during the club scenes at the beginning. It’s just wrong. That whole scene is ten pounds of wrong. CHOREOGRAPHY: (8) Cyril Raeffelli channels Jackie Chan-style fight choreography in some scenes, but is able to pull it off, playfulness intact. STUNTWORK: (9) The stunt men put their work in here, falling a lot and bouncing off of various pieces of walls and furniture, and the parkour chase scenes are great as well. STAR POWER (7): Neither Cyril Raeffelli nor David Belle’s careers have taken off as much as it would’ve been expected, which is disappointing. Elodie Yung appears to be getting more roles, and will star as Jinx in GI Joe: Retaliation next year. FINAL GRADE: (8) District 13 Ultimatum is a worthy follow-up to the surprise hit District B13, and parkour and martial arts has never looked better. NEXT: Jang Dong Gun, Kate Bosworth and Geoffrey Rush take on Ti Lung in The Warrior’s Way! Hello, Michael–your site was recommended to us by PJ Italiano. She sent all of us a memo telling us to check your site out. Great stuff man. Not bad, but it was spoiled with too many unnecessarily quick cuts and wrong shooting angles. For example, when Cyril jumps over stairwell there’s 5 or 6 cuts in less then a second. It looks awful. Epileptics, please do not watch it, or U will die. I watched it over Netflix. I liked Elodie Yung’s performance and look in this film. She is cold-blooded. The two action heros are ok but the acting and the moves are not as exciting as in the first film.